Answers to frequently asked questions about FM Scout Editor. I've paid for a license but haven't received anything. How long does it take? If you're getting this error "Failed to load Football Manager data: Could not find a compatible Football Manager version." it can only mean one thing. You have opted to the public beta builds of FM on Steam. We only support the official stable builds and not the public beta ones. You can either wait until stable version catches up with public beta or simply opt out from beta builds. How to activate the In-Game Assistant? IGA is a premium feature, so you need to have a license first. If you've got that, follow the steps outlined below. Open FMSE and go to File > Options. Tick the Enable IGA checkbox right below and click OK.
Open FM19 and go to Prefences > Interface. Hit the Clear Cache button. Then return to the same screen and press the Reload Skin button. Switch to FMSE19 and load your game. 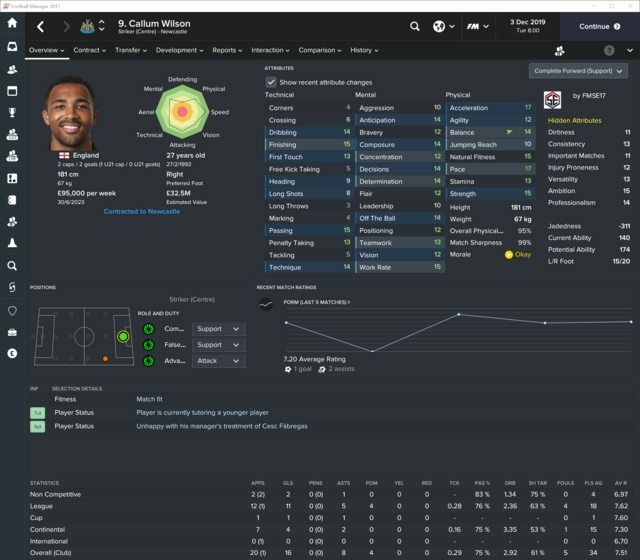 Switch back to FM19 and go to any player's Attributes screen. **Important: You have to use one of the default game skins. Otherwise it won't work. Does FMSE19 work with FM Touch 2019? Yes, it does. However, In-Game Assistant hasn't been implemented on FM Touch yet. How does Mass Edit work? There are 2 types of Mass Edit functionality in FMSE. The first one is the quick-actions to Heal Team, Remove Unhappy, Remove Bans and Destroy Team within the Teams tab (within the Club's panel). The second type is the more advanced Mass Edit dedicated panel you can access after selecting 2 or more players in search results. Simply search for whatever criteria you want, then multi-select entities using Shift-click, Ctrl-click or click-drag. Mass Edit tab should show up at the top middle area of the FMSE window. Click on it to find all editable data fields you can edit and then Save to apply these changes to all selected entities. I've just saved my edits, but I don't see the changes in-game. This happens because the game caches the screens you've already visited. If you press the "Continue" button in-game and move forward to the next stop, you should see the changes. If you want to see your changes immediately, you can disable the "Use caching to decrease page loading times" option, which can be found on the Preferences > Interface screen in-game. 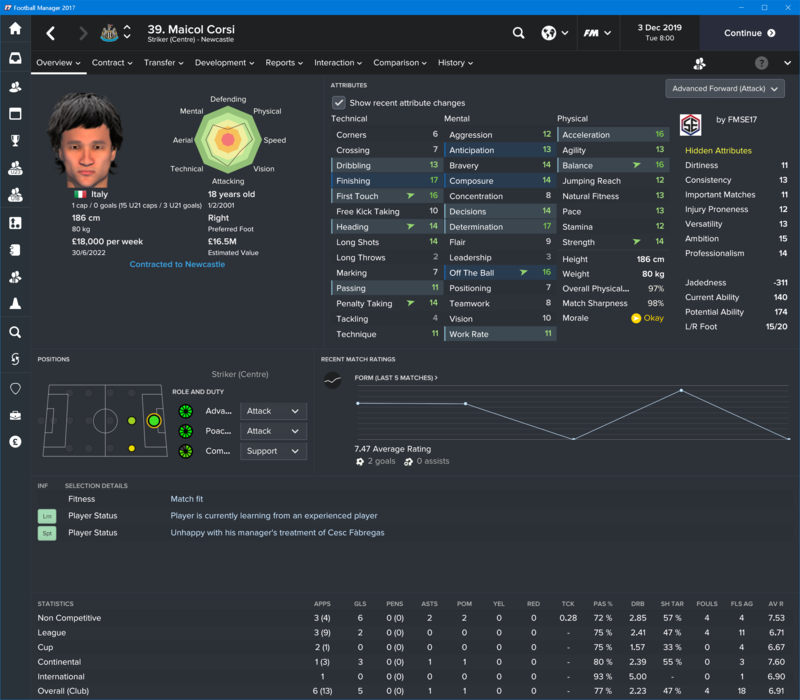 Will FMSE19 corrupt my FM19 saved game? We’ve extensively tested all available functionality of FMSE19 and found it safe to use; we experienced NO corrupt games whatsoever. However, as we're still in alpha version, please, keep a backup of your saved game before using FMSE19 to edit your game’s data. AppCake Ltd and FMScout.com cannot be held liable for any corrupt game files, or any other issue caused by the use of FMSE 19. A backup will make sure that whatever happens, you will still have your saved game intact. Can I use the same license key on both my desktop and laptop computer? You are free to use your license key on as many computers you own, but strictly for your own personal use. You cannot distribute it, share it, resell it or lend it to anyone else. Doing so will put your license key in a blacklist. What will happen when a new official FM patch is released? Whenever there's a new official patch out, we aim to update within a couple of hours. And while update time is dependent on external factors (such as patch complexity or other unpredictable situations), we'll do our best to deliver updates faster than any other third party tool out there. I want a certain new feature to be added. Will you add it? And when? We’re determined to showcase significant progress by rolling out updates every single week. Feature requests are very important to us and a weekly release schedule will definitely prove that to our users. Any doable feature requested will make it in one of our next releases. If you’re on Windows 64-bit and running the setup file as admin doesn’t help, we recommend getting another antivirus solution; all reputable ones should work fine with our installation. If you don’t want to switch to a different antivirus, you could momentarily disable the one you have. Loading game data on FMSE causes FM to crash?! This could be caused because you chose to install FMSE within the Steam installation folder. As a rule of thumb, avoid installing ANY programs inside the Steam folder. Just thought I would point out that bits above are fairly out of date. The FM Touch section for example. @Dutchy, we're looking into it. There are a couple of bugs which have been reported and we'll make an effort to fix them for our next version, alongside a major new feature; hopefully during this coming weekend. I just bought the licence for the In-Game Assistant feature. I followed the instruction above and did all 7 steps but it didn't appear anywhere in the player's Attributes screen. @ArsenalQ8: Any chance you're looking at the player's Overview screen instead of the Attributes screen? Overview is the default screen you get when entering a player's profile. just one more thing .. why is the IGA generated randomly and sometimes if you switch between player you get the same stats? did I do something wrong? I am launching FMSE17 and loading it wihile playing atm. check these two images. why does IGA generates randomly in my game as shown above? @ArsenalQ8: If you have configured Attributes screen to be the default screen you get when entering the player profile, IGA won't work properly. some changes I have noticed in-game except player preferred moves, any explanation why? Hey, I was using FMSE just fine for the whole day but suddenly, as I try to load the game as I advanced a day, it told me that my FM version is not compatible. Can anyone help me find out what went wrong? @CFC4: I'm not aware of any FM17 patches being released for a while and there shouldn't be any more of them either. @scott1701: Changes you make to player preferred moves are not all visible in-game; some of them are hidden. Running the FM18 demo 18.1.0 (non beta) and the latest FMSE but always getting the message "Failed to load Football Manager data: Could not find a compatible Football Manager version." Any ideas? You are reading "FMSE FAQ".